DC and Marvel might be rivals in the comics; but there was never any competition on the big screen. Thanks to its in-house Marvel Studios team, the Marvel Cinematic Universe has dominated the box office – unlike DC who has produced very few films and even fewer hits. DC hoped to change this by announcing Batman v. Superman: Dawn of Justice, a sequel to their moderately successful Man of Steel (2013). At first it seemed Batman v Superman would be the bedrock upon which DC would forge its own Cinematic Universe; but now it’s starting to look more like the cliff they will throw themselves off of. A supposed ‘leak’ today foretold how DC has plans to turn out three movies per year starting in 2016. If this is all true, then DC has no idea how much trouble they’re in for. Quite the packed schedule, right? We’re halfway through 2014 and DC has a year and a half to pull this all together. That’s a difficult task to begin with; but then you remember how Batman v Superman: Dawn of Justice was already pushed back a year due to production and DC not wanting “to compete with Marvel’s Avengers 2: Age of Ultron”. There’s an old saying ‘Rome wasn’t built in a day’; and that goes for movie franchises too. Let’s take other movie franchises for instance: 007, Star Wars, Indiana Jones, Bourne, etc. All of these had various installments, but they all started with a strong base film. Sure some franchises started from less popular films – Fast & Furious, Scary Movie, etc – but whether strong or moderate start, all of these examples followed the adventures of one main set of characters. DC would have various films that weren’t connected and would be ping-ponging all over the place rather than direct film to film sequels. The only proper comparison to make is to the Marvel Cinematic Universe due to its varied characters; but even then, Marvel has a pattern that works in phases. Marvel gives us four to five films and then concludes with an Avengers film. DC’s agenda is all over the place. Well known characters like Flash, Green Lantern and Wonder Woman are getting their films after Justice League – which would basically be the sequel to Batman v Superman: Dawn of Justice. DC is going with two relatively unknown heroes films before they give fan-favorites a go. Also, if Wonder Woman is going to be in Batman v Superman, then why is her film coming so much later? The truth is, it’s not much later. Wonder Woman – despite being the fourth film after Batman v Superman is only a year later; and that is what makes this schedule truly awful: the rushed feel. When the Marvel Cinematic Universe began with Ironman (2008), it introduced Hulk later that year and then waited an entire two years for Ironman 2. 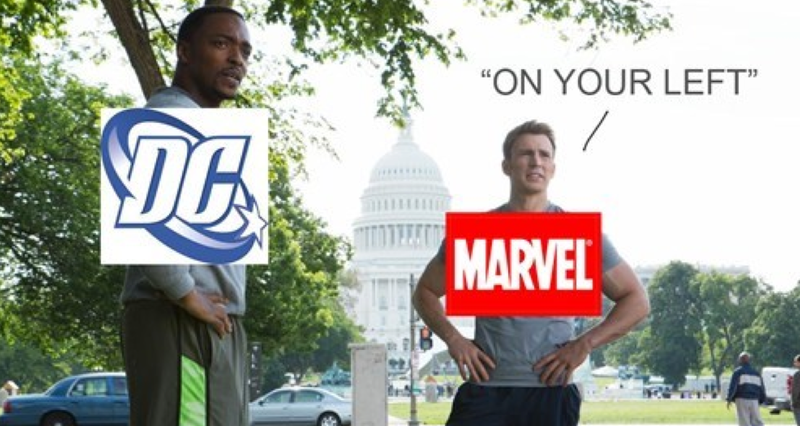 After that Marvel tried to do two movies a year. They found their groove and learned their limitations. This is the system that worked for them and it’s continued to this day. If you didn’t see Captain America 2: The Winter Soldier, you won’t know why this is funny. so go see it! DC is just starting to take the reigns on their film franchise and just because Man of Steel didn’t do as poorly as some of their past film, they think that means they can’t fail. It’s not impossible for them to reach Marvel’s level; but they are going about it in an awful way. If you want something, it takes time. If you rush it, it’s going to be ruined. Sadly, having an inexperienced studio turn out three films per year isn’t their only problem. As I said earlier, Batman v Superman was originally pushed back partly due to fear of competing with Avengers 2: Age of Ultron. I hate to break it to DC, but Avengers 2 isn’t the last of the Marvel films. Ironically, DC set the date of its Batman v Superman movie to release the same day as an untitled Marvel film. 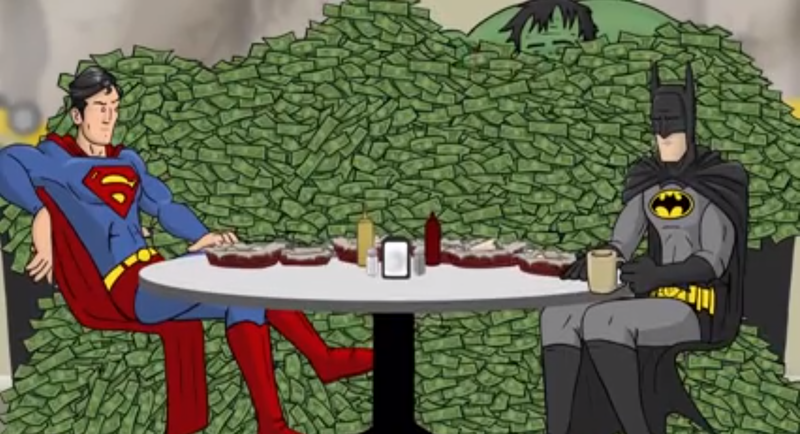 DC had hoped to squash a new Marvel title; but instead got paired with Captain America 3. The odds of Captain America 3 – the sequel to possibly the greatest Superhero film plot-wise yet – crushing Batman v Superman in the box office is staggering. Though the threat doesn’t end with Marvel. Star Wars, Amazing Spiderman, Independence Day, Transformers, Ted, Terminator, etc are all films that have huge established fan bases and just so happen to have two to three new films coming out within the next three years. If DC keeps looking for a slow period to draw people into their haphazard and rushed films, they’re sadly going to be out of luck. A movie studio with exponentially less experience than Marvel Studios will be producing more movies per year than Marvel Studios; and will give priority to much lesser known characters. To slightly change what I said earlier, the gamble that was Batman v Superman: Dawn of Justice might have been the foundation for a Universe; but if you rush that construction, the house will fall. I truly want DC to succeed; but with news like this you have to wonder who thought this would be a good idea. If this is indeed true, not even Superman can save them now. June 12, 2014 in DC. Tags: Batman vs Superman, Captain America, Captain America 2, Captain America 2: The Winter Soldier, Captain America 3, Marvel, Marvel Universe, The Avengers, Warner Bros.